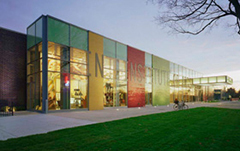 The Flint Institute of Arts is the second largest art museum in Michigan and one of the largest museum art schools in the United States. Each year, more than 160,000 people visit its galleries and participate in its programs and services. For 90 years, the FIA has been responsible for acquiring, protecting, and presenting a collection of art and artifacts spanning the globe. The world-renowned collection, which exceeds 8,000 objects, is significant for its depth of important European and American paintings and sculptures, 15th century to the present, and its extensive holdings of decorative and applied arts including important ethnographic study collections dating back five millennia. The FIA promotes the power of the visual arts by providing lifelong learning opportunities to engage and educate a diverse regional audience. The FIA is committed to making art available, approachable, and accessible to all through a broad range of interpretive programs in order to provide multiple ways of accessing information on the permanent collection and temporary exhibitions through guided tours; lectures and community dialogues; art classes, workshops, and studio demonstrations; gallery, studio, and outreach programs for PreK-12, Head Start, and homeschool students; films and videos; print, audio, and multimedia resources. The FIA presents educational lectures and community dialogues focusing on exhibition themes; offers 180 art classes, educator workshops, and studio demonstrations for participants ranging in age from toddlers to senior c tizens; and schedules more than 45 curriculum-based PreK-12 and homeschool programs serving tens of thousands of children. Films shown in the 330 seat FIA theater are selected to appeal to three distinct audiences: adults, college students, and senior citizens. Printed exhibition and collection catalogs, gallery guides, school brochures, audio guide entries, and online resources are produced to enhance educational opportunities for the broadest possible audience. As the fifth largest museum art school in the country, the FIA Art School runs at full capacity seven days a week with an annual enrollment of more than 1,700 students. The Art School remains dedicated to educational enlightenment through formal studio instruction in drawing, painting, sculpture, photography, mixed media, printmaking, ceramics, mosaic, fiber, glass blowing, and flameworking. The school also provides summer camps for youth, free family activities, and a pre-college portfolio development program for gifted high school students. The FIA is accredited by the American Association of Museums, an honor held consistently for more than 40 years, and has also maintained membership to the American Association of Museum Directors since 1989, proving its dedication to quality programming, adherence to standards of excellence, and commitment to education. Operating support for the Flint Institute of Arts is provided in part by the Charles Stewart Mott Foundation. FIA Exhibitions and Programs are made possible in part with the support of the Michigan Council for Arts and Cultural Affairs, a partner agency of the National Endowment for the Arts.